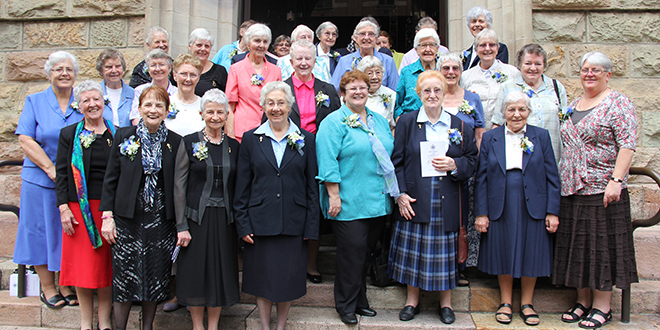 Giving thanks: Sisters of Charity outside St Stephen’s Cathedral, Brisbane, after a Mass of thanksgiving for the order’s 175 years of service in Australia. AUSTRALIA’S first women religious took “an enormous risk” to journey to Australia 175 years ago. This year, the Sisters of Charity of Australia honour that risk and the 175 years of “love, tenderness, and concern of Christ for the poor” at Masses throughout the country. The Sisters of Charity of Australia walk in the footsteps of five Irish Sisters of Charity who landed in Australia on December 31, 1838, at the request of Bishop Bede Polding, Australia’s first Catholic bishop. Mother Margaret John Cahill, Sr Alicia John Baptist De Lacy, Sr Eliza Francis Xavier Williams, Sr Catherine Frances de Sales O’Brien and Sr Julia Lawrence Cater volunteered to travel by boat to Australia, then considered “the most neglected part of the Catholic world”. More than 40 Sisters of Charity joined almost 1000 people at a thanksgiving Mass celebrated by Brisbane Archbishop Mark Coleridge at St Stephen’s Cathedral on May 31. The Mass was held on the feast of the Visitation, to acknowledge the contribution the sisters made in bringing to Australia a Latin composition of the Magnificat, said by the Blessed Virgin while visiting her cousin Elizabeth. Sisters of Charity of Australia congregational leader Sr Annette Cunliffe said last weekend’s celebration was “an enormously warm and affirming occasion”. Sr Cunliffe said the sisters’ story was one of always “responding to the needs of the poor, sometimes suffering for them”. She hoped her fellow sisters and those who worked with them “would honour the spirit of responding to the poor”. In his homily, Archbishop Coleridge acknowledged the sisters’ had been “mightily active” in spreading charity throughout Australia. “They have done many things, hospitals and schools certainly and obviously, but a host of other things as well, many of them far less than obvious,” he said.